I haven’t really had much in the way of apple spirits before. Not long ago I picked up a bottle of Laird’s Straight Bonded Apple Brandy. Laird’s is well known as Apple Jack, which is the Bonded’s little sibling. It has a long tradition in America. In Europe apple spirits are known as apple brandy or calvados, which comes from Normandy. It’s all tasty stuff. The apple flavor in the Laird’s Bonded is just great. The Jack Rose cocktail is probably the most well known apple jack recipe. Axel has Jose in parentheses for this one, and as that’s come down the line, that means to make this with tequila. He doesn’t make any notes about that though, so it’s curious thing hanging on the page. Also, the Lommebogen recipe is really different from the other two books, and the classic recipe that is served today (with slightly different ratios). He’s basically replacing the lemon juice with whiskey. Whoa. His recipe is not messing around. The modern version of the cocktail has the lemon/lime and grenadine at a 2 to 1 ratio(so more like .75 oz. lemon/lime juice and 1/3 oz. grenadine). I like applejack/calvados and I like this cocktail. The modern version (similar to the Savoy/Café Royal version) is already in my standard bar list. 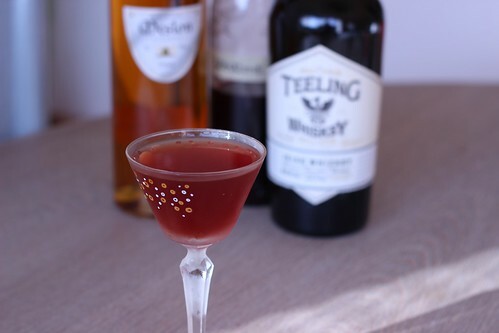 For the Savoy/Café Royal, I have to say that I like sours, but I prefer the ratio in this recipe over the modern one. I think a lot of that has to do with the fact that I have homemade grenadine which is not as sugary sweet as the store bought stuff. Using that, I can see why the modern recipe has compensated for that a bit. The Lommebogen recipe is very different, but still a very tasty cocktail. It packs more of a punch with the higher alcohol, but the grenadine tames it and blends nicely with the calvados. I’d make either of these, depending on if I’m in a lemon mood or not.